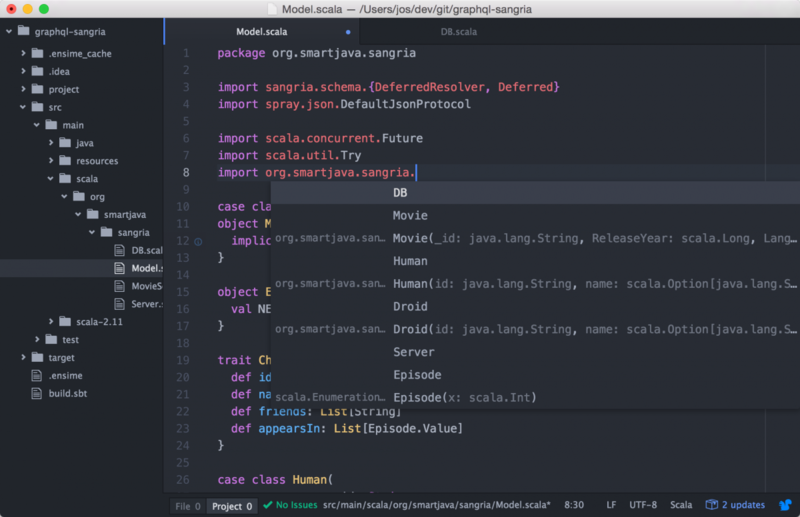 Check out how to get going with Scala in Atom using Ensime, from installing Ensime to project prep and import. When I began Java software development way back in the time of Java 1.3 I remember using JDeveloper for a time, before switching to the early versions of Eclipse. I stayed with Eclipse for a very long time (about 8 years) before switching to IntelliJ about 4 years ago. 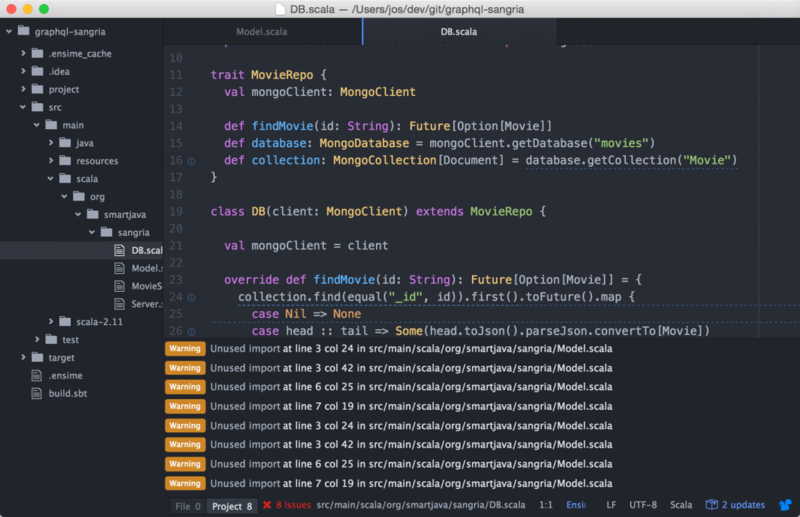 I've always been a big fan of IntelliJ, not just for programming Java, but I also kept using it when I started with Scala a couple of years ago. Last months, though, I started noticing that I actually only use a small amount of all the IntelliJ functionality and was slowly getting a bit annoyed with the way IntelliJ slowed down to a crawl for certain Scala projects. Combined with the fact that IntelliJ tripped over some Shapeless, Spray, Scalaz stuff, made me start looking for an alternative leightweight Scala editor. Since I already am using Atom for taking notes (nvAtom in combination with a synced dropbox folder works great! ), and I tried Ensime a couple of months ago, I thought I'd gave that combination another try. In this article, you can read the steps I've taken, the plugins I've installed to get to a fairly good working Ensime/Atom combination. I've waited with this article until Scala 2.11.8 came out since it solves a number of issues with imports and implicits when using Ensime. So for the best experience of using Ensime, upgrade your projects to Scala 2.11.8. So with that out of the way lets get started with installing Ensime. To install Ensime, just follow the instructions on the site (http://ensime.github.io/editors/atom/installation/), and you'll get an atom which you can use to run Ensime. Once installed, make sure you point to your local sbt installation, and you're more or less ready to start using Ensime. The last thing we need to do is install an sbt plugin which is needed to generate some information Ensime needs. 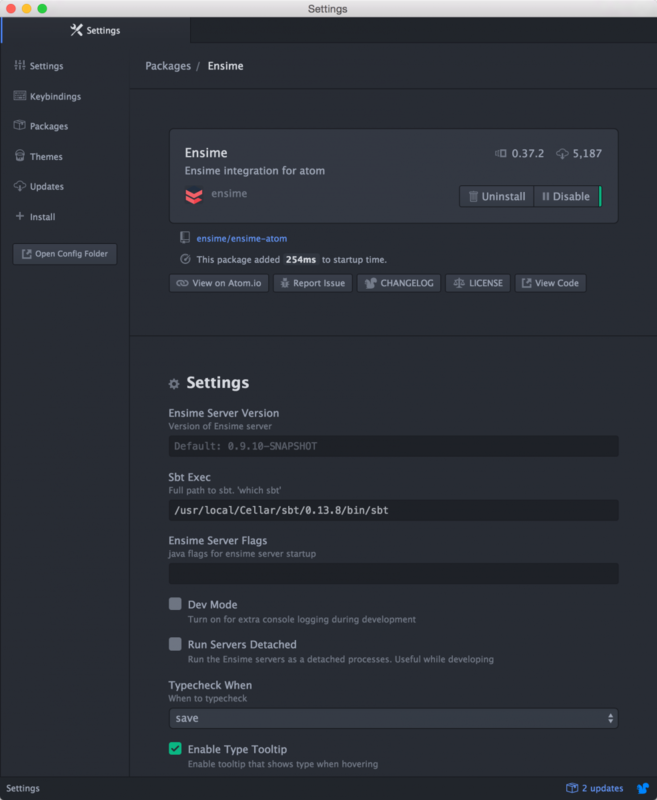 Follow the installation instructions from here (http://ensime.github.io/build_tools/sbt/) and once done open a console and navigate to the project you want to import. If you haven't already done so, update the Scala version to 2.11.8. In that directory call `sbt gen-ensime`. Note that I use the following sbt wrapper (https://github.com/paulp/sbt-extras), which drastically reduces the output of SBT only to the necessary, and provides a lot of additional features that make working with SBT a little easier. So when you run this, you might see some more information. The import thing to notice here is that we've got a `.ensime` and a `.ensime_cache` directory now, which contains Ensime specific files. In Atom open up a new window, add that folder and you can use ctrl-cmd-p `Ensime: start` to start Ensime. I'm an avid IntelliJ user, and one of the features I noticed I used a lot when I started using Atom, was the auto-import function of IntelliJ. Ensime/Atom provides something similar, but it is by far not as useful as the IntelliJ one. With Atom/Ensime you can import a suggestion, but (at the moment) it just selects one, instead of allowing you to chose. More often than not the wrong one gets imported. Even though the import feature is an annoying one, it's just a matter of time before it is added, since Ensime does provide multiple hints, it's just that the Atom/Ensime plugin doesn't support it yet. Or just `ctrl-click` to go to the declaration. While Ensime/Atom is quickly getting better, at the moment, for some projects, there could be some really blocking issues. If you use a project that uses macros or some compiler plugins, you might get false errors. I was going to show a project where false errors where reported, but with the latest version the errors apparently don't occur anymore in my spray/shapeless project. So I took one of my other projects (which uses a lot of Scalaz stuff), where IntelliJ has issues with as a test to see how Ensime/Atom handles that. While it takes some time for Ensime to compile everything and get to a stable state, it handles everything correctly! Development of the Ensime server goes quickly, as I've just noticed myself. A month ago there were a whole lot of issues with spray/shapeless which seems to have been solved now (whether this is through Ensime improvements or scala 2.11.8 I don't know). 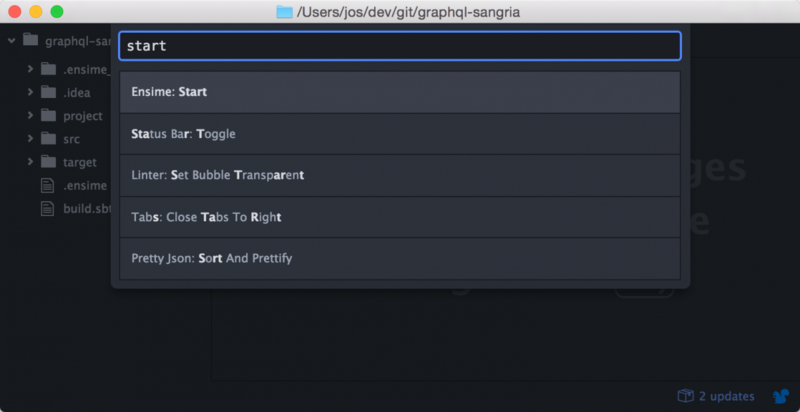 The Atom plugin has some rough edges, but is already really useful. One of the biggest advantages is how lightweight Atom is in comparison with IntelliJ. So I'll start working with Atom more and more, but will probably come back to IntelliJ for certain type of projects. Published at DZone with permission of Jos Dirksen . See the original article here.